It’s been a great experience growing cannabis plants in your AeroGarden™. But now, there are two critical steps ahead for optimal results. 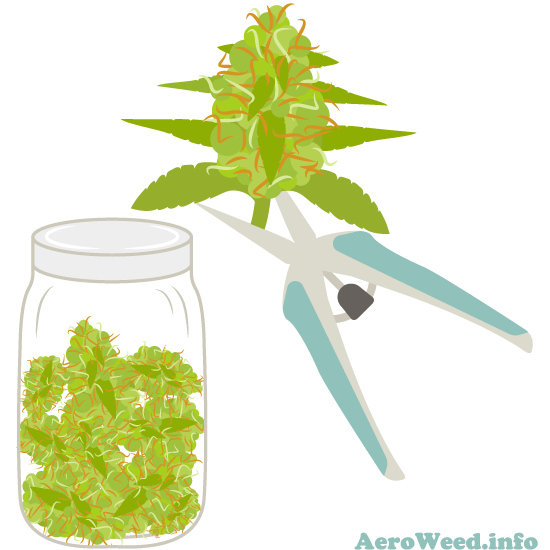 Harvesting too early can reduce the potency of your crop, and if you harvest too late, your buds will have a more intense effect that glues you to the couch. Curing your buds will enhance taste and quality. Some growers claim it also helps to improve potency. The harvest time is near when pistils become mostly red while the trichomes turn milky. Trichomes look like little crystal mushrooms growing on the buds and leaves near buds sites. 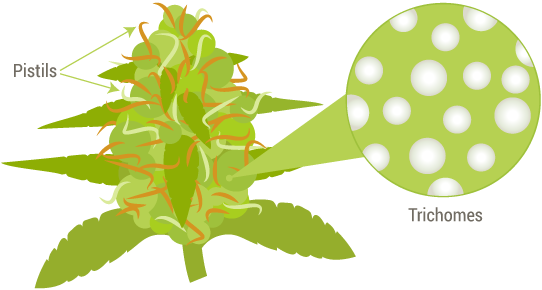 Trichomes gland holds the cannabis resin that contains THC, CBD, and other cannabinoids. Examining trichomes is the best way to harvest at the right time. I use a pocket microscope to assess the stage of trichomes. Harvest your plants when trichomes are all cloudy to have the highest psychoactive effect. Cloudy trichomes glands signal the peak of TCH production. 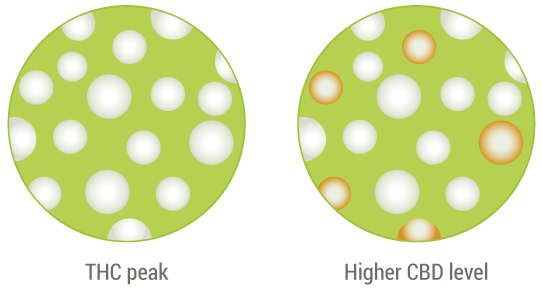 If you wait to have a 20% to 30% amber trichomes, your buds will have lower THC concentration and higher CBD level. 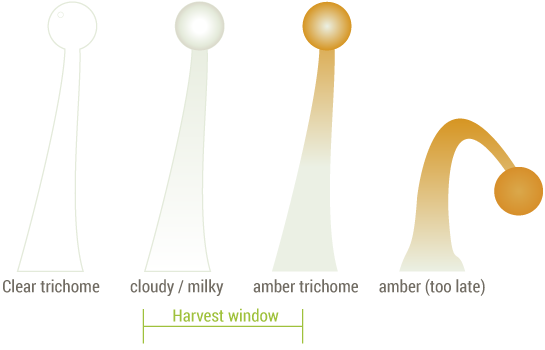 Key takeaway: The harvest timing influences the level of THC and CBD. Drying is an important step. If you own a grow tent with a carbon filter, then you can use it to dry your crop in the dark without any odor. At this step, you can defoliate the plants, this will help the drying process. Ideally, the plants should dry for 4-7 days upside down, until small branches are dry and buds still moist a little bit. Finally, you should trim your buds and put them into jars to begin the curation. Cannabis curation is extremely important and often overlooked. I store my buds in jars or curing containers at 62% RH for three weeks or more. I use Boveda 62% packs to regulate the humidity. In the first weeks, open the jars once a day to avoid mold and replace the air. In my experience, cannabis curation has a clear correlation with an improved buds taste and a smooth vapor. It may also reward you with a better smell, appearance, and make you higher.